Address: 14/83 Moo 5, Rawai, Phuket. 83130 Thailand. Transport: Need an Airport Transfer? Nestled in a prime location, on the south-east coast of Phuket, overlooking the marvellous Rawai Beach coastline, The Serenity Resort is an ideal base for island exploration. A convenient departure point for trips to Bon Island, Coral Island, Phi Phi Island and more, The Serenity Resort is located just 25 minutes from the historic Phuket Town and the other popular shopping and entertainment districts, including Patong. Take Thepkasattri Road to the Bypass Junction (Bang Ku Junction) and take the right hand turning and continue south, past the Central Festival Shopping Centre Junction. At Chalong Roundabout, continue South and you can find The Serenity Resort and Residences is on the left side after the Tesco Lotus Supermarket and before Friendship Beach. Just 4KM from the Kata Viewpoint and Promthep Cape, famous for their spectacular sunset views, there are a wealth of attractions and activities to keep you entertained, from Safari tours and Elephant Trekking, to the Phuket Fantasea Show and Thai Boxing, to visiting one of the four nearby beaches; you will never be short of something to do at Serenity, unless you want to be. 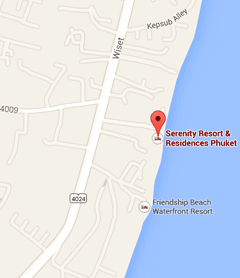 The Serenity resort offers a relaxed beachfront luxury setting, just 45 minutes from Phuket International Airport. If you wish to take the hassle out of your arrival, just let us know and we will collect you from the Airport in one of our luxury cars, available at 1,400+ (Max. 3 Guests) for limousines and 1,600+ for Mini Vans (Max. 6 Guests). You can arrange your Airport pickup by contacting our reservations team. Know your flight details? Want to book an airport transfer? Book a Transfer! Copyright © Triple C Hotels & Resorts Phuket. 2018. All rights reserved. book an airport transfer during the booking process.